The chart's plot area is the zone where all data points are drawn (see Figure 1). The API of the chart allows you to get information about the area or apply a custom style for the visual element that represents it. The chart's axes are not included in the plot area. You can get information about the plot area's boundaries via the PlotAreaClip property of the chart. The property is of type RadRect which contains the position and size of the plot area. The chart fires the PlotAreaClipChanged event when the boundaries change. The provided information doesn't include the currently applied zoom factor. By default the elements presented by the chart (series and annotations) are clipped into the plot area. Anything that leaves the boundaries won't be rendered. To alter this you can use the ClipToPlotArea property that is exposed by the elements. Its default value is True. 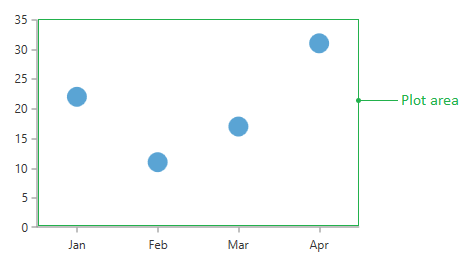 You can customize the plot area visual via the PlotAreaStyle property of the chart. It is of type Style and the expected TargetType is Border - the area's visual element. The stack order of the elements in the chart is determined by their positions in the items collection that holds them. You can additionally control which element is displayed on top by setting the elements' ZIndex property. 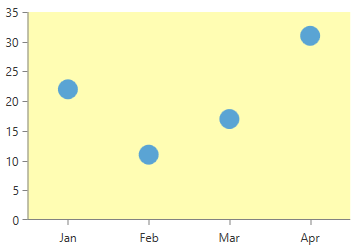 RadChartView elements which have this property are Series, Annotations and Axes.